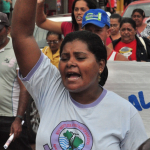 The Movement of Dam-Affected peoples in Brazil (MAB, by its Portuguese acronym) warns that the construction of dams affects women more intensely, and that it is women whose rights are more brutally violated. A well-known tragedy is the incentive for prostitution and trafficking of women—problems which take place with companies’ complicity. Earlier this year, the police dismantled a brothel on the highway that accesses one of the Belo Monte project construction sites, where there were women—including minors—living in conditions of slavery and private imprisonment. In spaces where dams are built, women are a mere commodity to entertain workers.